Cersei wears a mourning gown to the trial of her brother, Tyrion, on Game of Thrones, Scarlett O’Hara dances in mourning clothes in Gone with the Wind, and a 3rd c. fresco from the Hypogeum of the Aurelii in Rome shows Roman senators in their togas. Arvandus proceeded thither freshly groomed and barbered, while the accusers waited the decemvirs’ summons unkempt and in half-mourning, snatching from him thus the defendant’s usual right, and securing the advantage of suggestion which the suppliant garb confers…Eye-witnesses report, as the most pathetic feature of all, that as a result of his intrusion upon his judges in all that bravery and smartness while his accusers dressed in black, his pitiable plight won him no pity when he was led off to prison a little later. How, indeed, could any one be much moved at his fate, seeing him haled to the quarries or hard labour still all trimmed and pomaded like a fop? (Ep. 1.7.9, 11 trans. Dalton). Aravandus’ appearance before the Roman senate was boastful and presumptive, while the accusers showed humility by looking disheveled. There was a rhetorical purpose for appropriating the clothing of mourning, such as a toga pulla: it was meant to curry pity from the jury and the audience. As Fred Naiden (2006: 58-59) has asserted, such mourning clothing also suggests supplication. When the senator Publius Rutilius Rufus (cos. 105 BCE) refused to remove his senatorial insignia or put on darker clothing during his trial in 92 BCE, he was roundly criticized; however, he used his clothing choices as a proud profession of his innocence against the charge of provincial extortion. I mean, he was still convicted by a group of disgruntled equestrians, but by god, at least he looked like a senator during the process. Relief of a Roman funeral procession. From Amiternum, 1st century CE. Museo Nazionale d’Abruzzo, L’Aquila, Italy. Note the mourners on either side of the bier. Clearly, one’s choice of clothing within the courtroom conveyed a number of messages to the audience. 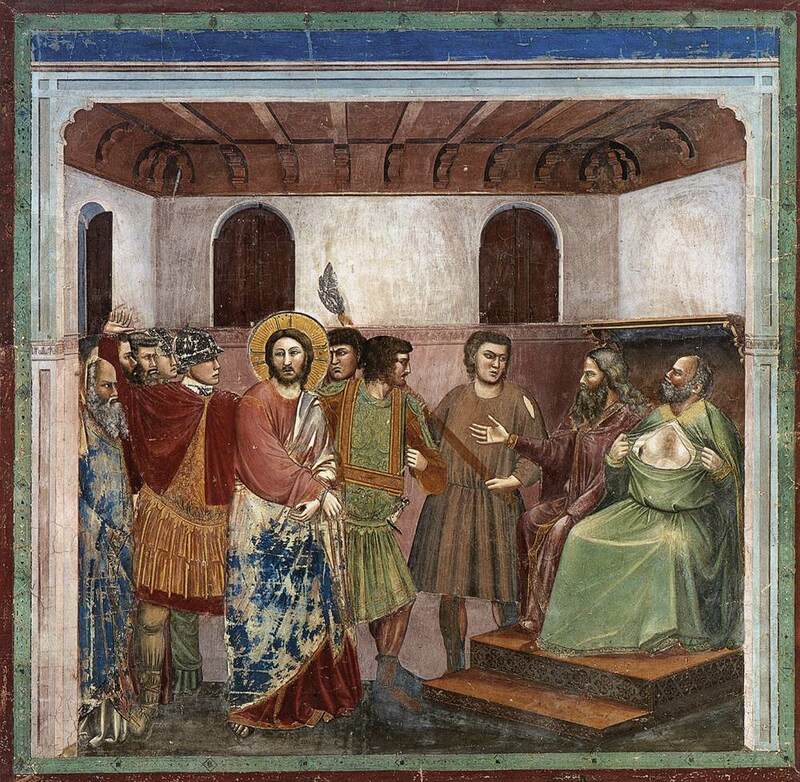 Just take the visual rhetoric spoken to us when we look upon this late antique depiction of Jesus’ trial before the Sanhedrin (6th c. CE, Church of Sant’Apollinare Nuovo, Ravenna). The high priest Caiaphas and the rest of the priests are decked out in swanky clothing reminiscent of Roman senators, and they have on some expensive red boots (O, just as Julius Caesar would have liked!). Jesus is depicted in regal gold and purple, but he does wear some simple sandals at the pre-trial hearing. This depiction of Jesus is all conjured from the head of the mosaic artist, but the trial’s depiction is clearly telling us something about Jesus and about the Sanhedrin through clothing and through shoes. 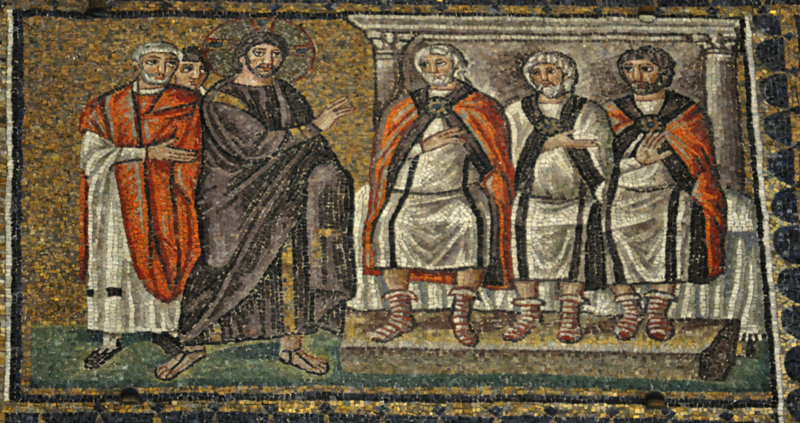 Jesus Before the Sanhedrin (6th c. CE, Church of Sant’Apollinare Nuovo, Ravenna). Matthew 26:65 tells us that while considering what charges to bring against Jesus, Caiaphas dramatically tore his robe–also an act reserved for funerals and occasionally for the courtroom melodrama: “Then the high priest tore his clothes and said, “He has spoken blasphemy! Why do we need any more witnesses? Look, now you have heard the blasphemy!” The most famous depiction of this scene comes from Giotto in the 14th century. Giotto’s (c. 1304) Christ before Caiaphas – at the Cappella Scrovegni in Padua, Italy (Image via Wikimedia). Mourning dress could also be used in public spaces in order to protest and to plead. In 98 BCE, Quintus Caecilius Metellus wished to have his father recalled from exile. He grew his hair out (likely going unwashed), donned mourning dress, and badgered citizens in the Roman Forum in order to pass a law to allow his father to return. The people took pity and obliged his request. We are told that Quintus was nicknamed Pius thereafter. Publicly following around your accuser in mourning dress was also a tactic of some in Roman society, particularly if you wanted to accuse someone visually and did not have the money or status for a trial. As Leanne Bablitz recounts, others simply brought charges against an individual and humiliated them by first forcing them into mourning dress and then stalling the case, so that the defendant was forced to walk the streets of Rome in tattered rags (Bablitz 2007: 84-85). Clearly, mourning dress was a visual tool not just limited to the funeral. Winona Ryder listens as the verdict is read at the Beverly Hills Municipal Court during her shoplifting trial (Image via CBS Baltimore). These examples indicate that in court, what one wears has always mattered. As Robert Gordon, a jury-consultant and Texas psychologist stated in an interview, “Whether you dress casually or formally, wear a tie or a dress, choose bright or dark colors, all make a difference in terms of how you are perceived.” Darker colors advertise humanity. They also communicate contrition to a judge and jury. Wearing bright, flashy, or highly expensive clothes send a message in the same way that muted colors do. Just check out the dark “headband of innocence” that actress Winona Ryder wore to her shoplifting trial. That is some serious contrition. Color and clothing in court was not just a consideration of today. When magazines or the news pay rapt attention to the appropriateness of what Lindsay Lohan wore to court, we should perhaps also reflect on what Roman judges, juries, and audiences picked up on. Although we may rely on the texts of Seneca, Cicero, Quintilian, and the jurists in order to recreate the Roman courtroom, a full reconstruction must include the colors, clothes, smells, and sounds that accompanied the speeches. These visuals were an accompanying rhetoric too often overlooked.